This is John from the future. Bald John. Fat(ter) John. Running from sentient robots intent on eliminating the human race John. Just kidding. There are no evil robots, but you are fat and you do have a great big bald spot on the top of your head that burns horribly when you go out under the o-zoneless sky. Anyway, human time travel is not possible yet, but email time travel is. So I figured I would send you this letter to help you find your way through the next 35 years. Unfortunately, after Emperor Trump passed the Forced Mashable Media Law of 2030, all correspondence and publications are required to be click bait lists. So without further angering the cameras that are watching me at all times, I will now proceed to give you an easily digestible tips for you to cope with the hairless hell-scape the world has become. Stop shaving your head. I know it is hot in the summer, but in 2025 the radiation from the sun causes you to grow a small twin brother in the middle of your scalp. He’s ok, and pretty good at cards… but that’s about it. He’s kind of a jerk. Don’t vote for Gary Johnson in the 2016 election. It doesn’t make a difference that you do, but you feel really silly about it when he comes out as a Lizard Person in a couple years. Seven miles away from you there is a guy named Kyle who lives at 538 Manchester. I need you to go to his house and punch him in the face. Don’t ask questions and don’t stay around after you do it. Punch and run. Trust me. Start using Rogaine now. The sooner you start, the better the results will be. That light area on the top of your head that you hate when you see it in pictures? It gets bigger. Then you start shaving your head and then you end up with Harold (see #1). Seriously, stock up on Rogain now. Once the emperor finally loses his hair he outlaws hair treatment for everyone. The only place you can buy Rogain in the future is Australia, and they stopped letting in American refugees years ago. Quit telling the kids they can be astronauts. They can’t. They are eventually assigned work duty in the gold mines to help construct the great wall. After that they become mole people. Sorry. Now that I think about it, you may just want to move to Australia now. The mutant koalas haven’t shown up yet, and you have plenty of time to fortify. You should give up on twitter. This doesn’t really have any implications on the future, but you’re not really enjoying it and it feels more like a chore than a social channel. That doesn’t change in the future. As amazing as combining the UFC and the Congress sounds at the time, it is a horrible idea. Vote “No” Prop 335. Oh no! We're already to number ten. Hug your family every day. Keep making silly jokes. Don't worry too much about going bald. Eat better. Tell your wife you love her. Do the laundry more often. Avoid skydiving. 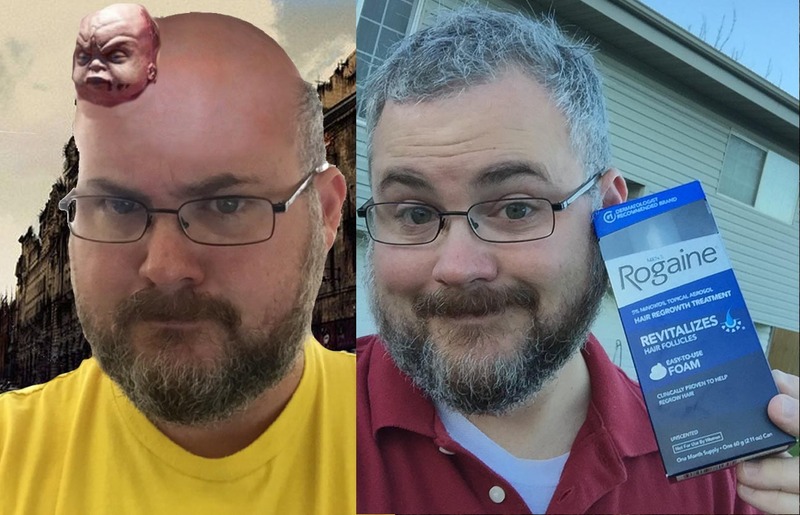 Thanks to Rogaine for sponsoring this post. You can find them being funny AND growing hair on Facebook and Twitter, Also, here's their new commercial. I love being bald. Did the hair thing but was never as happy as when I started shaving it all off. Protection again the elements? I wear a hat! I own many hats.